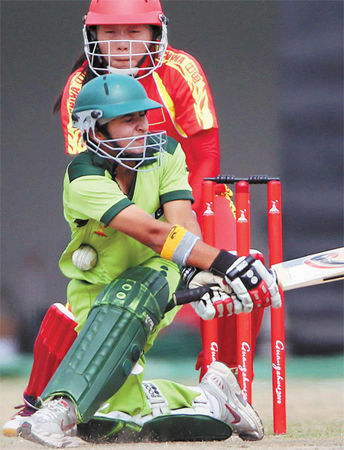 The Guangzhou Asian Games have made Sana Mir, Captain of the Pakistan Women’s Cricket Team, feel like a big-screen star. Pakistan, the tournament’s No 1 seed, easily won its game against newcomer China by nine wickets on Monday, but that sparkling effort was not what truly impressed Mir. “We never get this kind of media coverage back at home. I am just so glad the sport made it to the Asian Games,” said the 26-year-old. “There is always TV coverage when the Men’s Cricket Team plays in Pakistan because it is huge, but you never see us playing on big screens or TVs,” she said. Although Pakistan has 500 to 600 professional women players under the age of 19, and about 1,000 to 1,200 playing at the senior level, they are overshadowed by the men’s game, said Ayesha Ashhar, Manager of the Women’s Team. Meanwhile, Ashhar said women’s cricket in Pakistan has improved rapidly over the past two to three years, thanks to an effective domestic structure which helps players to train and progress at a young age. She also said China definitely gave the No 1 seed a surprise in Monday’s match – the first between the two countries. “For a young team that only has three years’ of history, what China did on the field was excellent – especially the bowling,” the manager said. Currently all of the Chinese players are converts from other sports, including Rugby, Softball, Volleyball and Athletics. “Cricket needs many years to become established in a country. For China, the challenge is to attract enough talented players and coaches. But I believe when China chooses to develop a sport, it succeeds,” Ashhar said.